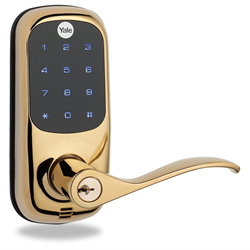 The YRL220ZW605 Lever Lock from Yale is a highly secure lockset that comes with a 12-button illuminated touchscreen pad. It’s powered by four AA batteries and is meant for installation on single bore holes only. 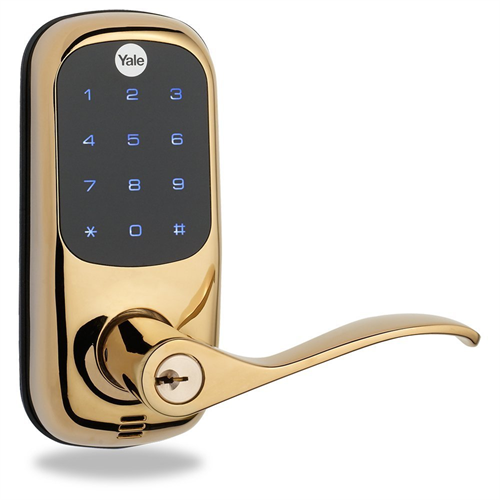 This keyless lock allows users to lock and unlock the door manually from a Z-Wave compatible home controller. It also allows users to receive notifications and alerts on their phones in the forms of email and text messages. A history library in the software lets property owners view the last 500 users to access a door, giving them a greater control over knowing who entered. Comes in a bright brass finish.